The stars have been sharing behind the scenes photos of the shoot and teasing fans for months now but this image is the first official look from Sony Pictures. Men in Black are back in action. 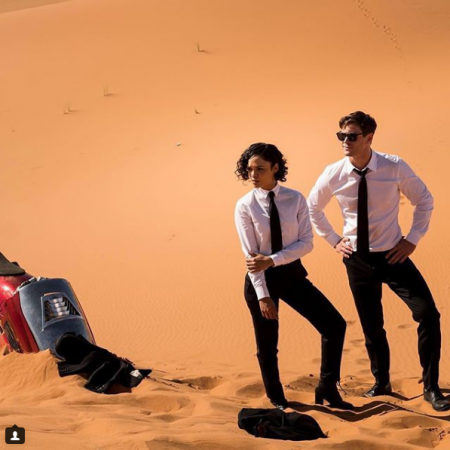 The Men in Black spin-off, Men in Black: International starring Chris Hemsworth and Tessa Thompson in an ensemble cast just released its first image. The picture shows Hemsworth's Agent H and Thompson's Agent M with their guns out facing off against what we can confidently guess as some kind of alien threat. "#FBF shooting MIB with my partner in galaxy protection @TessaThompson_x when we were ripping aliens a new one," the actor tweeted." From memory, this shot was taken in between set ups when we noticed some criminal activity on the streets in London. #MIBInternational We immediately drew our laser guns and took down one of the largest crime syndicates in the city. Happy to say the streets of London are now safe again. You're welcome world." Imagine Alien Crime Syndicates with legitimate mafia bosses? How cool would that be? We can't wait for MIB: International to hit the silver screens. MIB: International is directed by F. Gary Gray, who also directed The Fate of the Furious, so we know that the new movie will not skimp on the action. The spin-off won't feature Will Smith or Tommy Lee Jones, though one can hope they do make an appearance, even if as an end credits easter egg. Liam Neeson will play the head of the London headquarters of the MIB. While Emma Thompson will return as Agent O, chief of the MIB organization, Rebecca Ferguson, Kumail Nanjiani, and Rafe Spall will round out the rest of the ensemble cast. The movie opens in theatres on June 14, 2019.